Tools: Putty knife, large flat screwdriver, circular saw, side cutter pliers, utility knife, scissors. 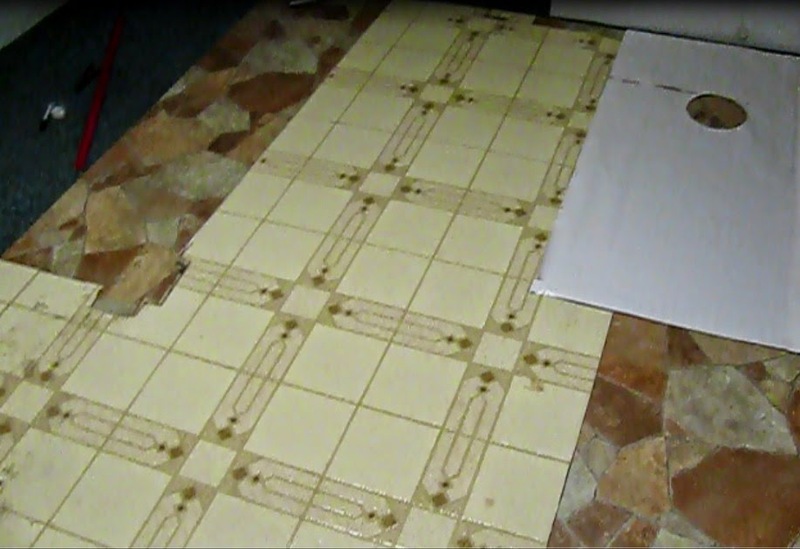 Parts and materials: Replacement underlayment (2 by 4 feet) Replacement vinyl flooring. Home mechanic estimated time: 6-8 hours. 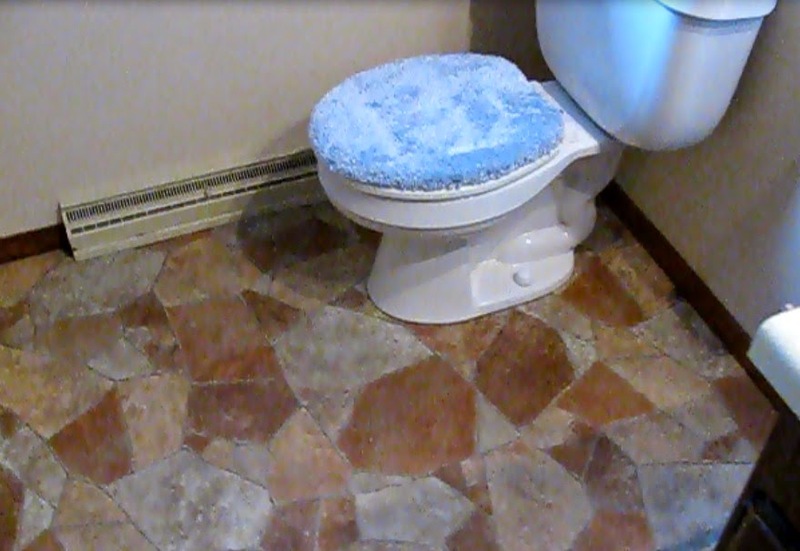 1) Make sure to cover the toilet drain so nothing will fall in the opening. I cut a piece of cardboard to size and put a weight on it to hold it in place. 2) Cut out the part of the damaged vinyl. I intend to use the old floor as a template for the new, but the bad piece is moldy so I cut it out, bagged it up quickly and threw it away. 3) Remove the damaged underlayment. I used a putty knife on the damaged parts and a long screwdriver on the rest to pry it up. The staples can be pulled out with side cutter pliers. Any that break off can be pounded back in. 4) I decided to remove a two by four foot section of the old underlayment. Replacement ¼” thick plywood is sold in that size, among others. On the side away from the wall, a circular saw will do a good job. Make a line where the cut will be needed. Set the blade height so it only cuts through the old underlayment and plunge cut on the line. Now pry out the old piece. 5) Prep the floor for new underlayment. It needs to be clean and flat, so make sure all the old staples are pulled or pounded in and the floor is clean and dry. 6) But suitable underlayment and cut to size. 7) Make an opening to fit around the toilet drain. 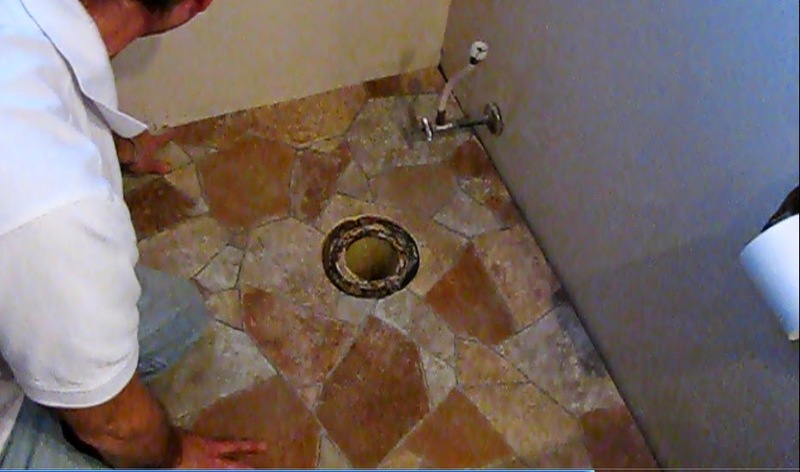 Measure from each wall to the middle of the drain. Mark the edge of the underlayment to match the wall it will be mounted against. Make a mark on at the intersection of the two measurements. Now set a protractor to the radius of the outside of the drain flange. Tightened the protractor and make a circle with the intersected mark as the center. Now drill a hole with the outside of the drill bit just touching the inside of the circle just scribed on the underlayment. The hole should be big enough for the wood cutting jig saw blade to fit through. Cut out the hole with the jigsaw. 8) Check the fit of the cut hole with the drain. File as necessary for best fit. 9) Mount the piece of underlayment with flooring staples and staple gun. I did not have a flooring stapler so I used 1 1/8 inch coarse drywall screws direct drilled and counter-sunk. 10) Fill in the any cracks and cover the screws with wood filler. Sand the seams where the new and old underlayment meet with a belt sander or other if they aren’t perfectly flush. End of underlayment installation. 11) Remove all casings, registers and door trim. 12) With all the trim off it should be easy to remove the old sheet vinyl flooring in one piece. 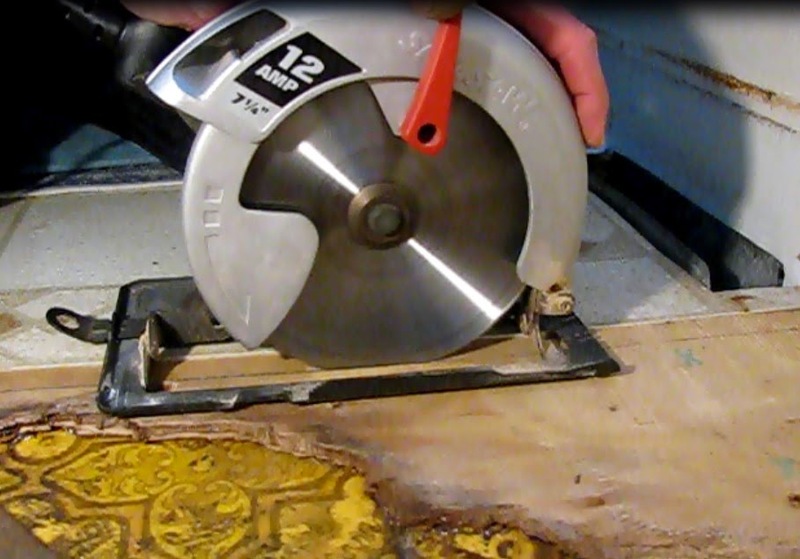 It will be used as a template to cut the replacement flooring. I did have to re-create the toilet drain portion since the old vinyl was damaged. 1) In a suitable workspace, put down the replacement sheet vinyl and lay the old vinyl on top in one piece. Now outline the old flooring on the new with a marker. 2) Using a scissors and utility knife, carefully cut the new sheet vinyl on the inside of the lines. I used Tarkett sheet flooring. 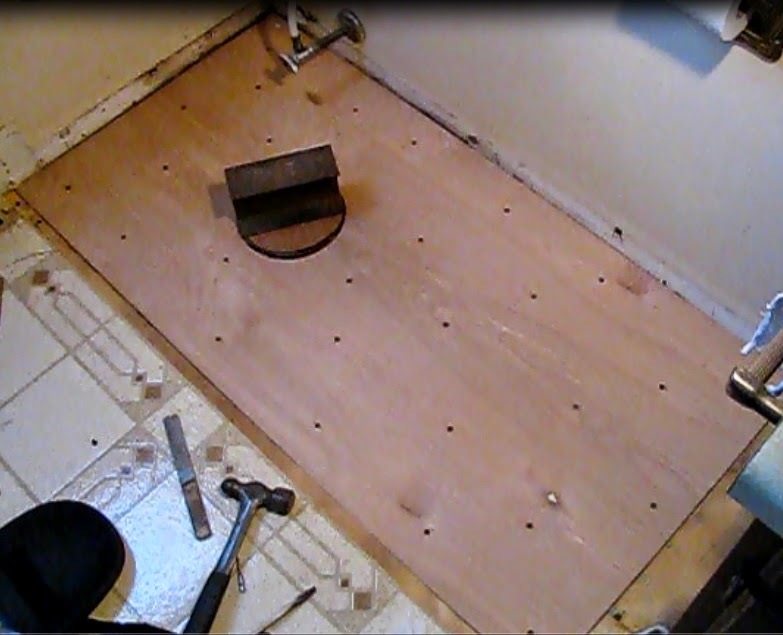 3) Lay down the new flooring and check the fit, trimming as necessary to allow a small gap at the edges. I did not use an adhesive as this flooring did not require any. 6) Re-install casings and door trim. Lookin’ good. Great post on flooring. It’s really going to help people to install floors in their homes in an easy way. Thanks for viewing the post and commenting. I was fortunate in that there was an old floor under the damaged one and the damage was restricted to that floor and not the sub floor itself. The damage was also only a few square feet. The bad finished floor was sheet vinyl so I just changed the whole thing out. Often times when I am looking into a home repair, I only find a parts and supplies list. I really appreciate that you have put a price to everything that I will need. Now I can properly budget for my water damage restoration project. Let's hope that I can acutally fina ll the needed supplies. I appreciate the comment and wish you success on your project. water damage anaheim Restoration. We use various techniques in numerous applications. Shop our selection of Laminate Wood Flooring in the Flooring Department at The Home Depot.Nice Post !! I like it, it also comprises a lot of useful facts. thanks to share your experience. Finding the best professional for your Water damage restoration is the main thing to get your problem resolve quickly. I liked the importance of keeping human/humane touch with the students and parents in this era of digital literacy. Game Development and Design Saudi With our expertise in game development and app development domain, we believe that any concept or learning in any industry can be gamified which makes learning more engaging and the objectives can be. If, you are you for someone who can help in dealing with water damage then you can contact waterproofing experts at Johannesburg. You can confirm here that you have reached the right place for quick assistance. The floor of my house got damaged few days back. And I have got good information from this post. Thanks a lot for sharing this information and tips. The content of the post is really very good. And you should also make people aware from texas disaster restoration agencies that provides 24/7 services.